Rick (Ram John Holder) is chased onto the ruins of a demolished house (the location overlooked the Addington Street entrance to Waterloo Station, now redeveloped) and beaten by thugs. Jill Crowley (Jane Merrow) and Margaret (Cleo Sylvester) do the best they can for Rick after they find him. Establishing shot of Hampton House, as the offices of the Reniston Group shipbuilders. 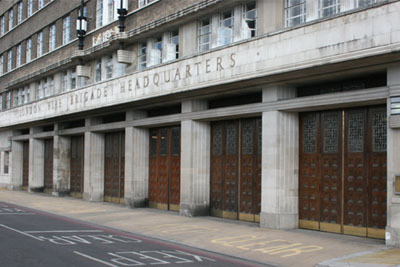 Fire brigade called out (fire engines leave London Fire Brigade Headquaters). Contractors clearing an old bomb site (for new St Thomas Hospital buildings) discover a skeleton and a gun in amongst the rubble. Establishing shot of the Palace of Westminster. Gene Bradley (Gene Barry) meets Mr Parminter (Barry Morse) to discuss Lady Diane Battersley. 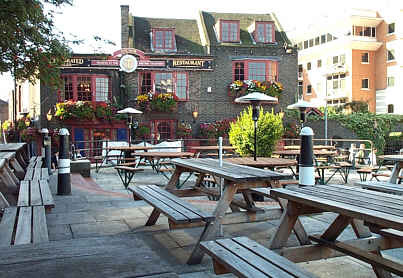 Rachel walks beside the river and comes to an outdoor, rooftop area (demolished) run by The Anchor public house. 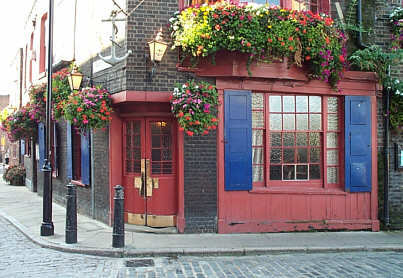 She then enters a pub as McGill (Richard Bradford) deals with the man who was following her. He then chases down a corridor/tunnel (under the railway bridge) after a mysterious figure that could be Harry Tyson. McGill makes his way to the pub to talk with Rachel. Captain Tork (Graham Haberfield) thinks he sees Hamlyn Gynt on the corner of the street and grabs him. Security Van drives along Bankside, and enters Saunders Chemical Works (redeveloped site possibly The Globe theatre). After the robbery the Security van and a Land Rover with the villains aboard leave the scene of the crime. John ‘Benny’ Benson (Derren Nesbitt), Syd Benson (Michael Cashman) and Freddy Tisdale (John Hurt) are on the roof of the warehouse and watch as police cars begin arriving. Mr Parminter (Barry Morse) and a Police Superintendent (Paul Williamson) watch from an unmarked police car as Brian Hamilton (Stuart Wilson) enters the bank (Lloyds Bank on York Road). Norman Shenley (Denholm Elliot) and Lolly (Lucy Gutteridge) go to visit a block of flats as part of their estate agency duties, Campbell Building C Block, but they have visited the wrong block and it is being demolished (the flats have been demolished in reality). Roy Gates (Ian Hendry) and Michael (Matthew Ryar) talk on the deck before Gates leaves in a Landrover. Dee drives towards Lambeth Road past the Palace of Westminster. It's early in the morning and Jeff has had a successful night at Alan Corder's cambling club (establishing shot of morning by the River Thames). 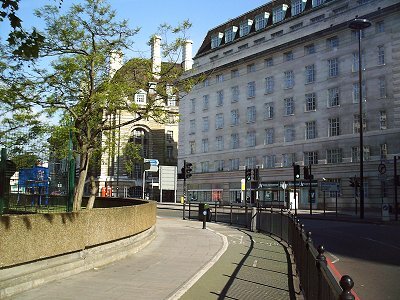 Marty is wandering the streets of London alone at night (establishing shot of Albert Embankment near Lambeth Pier). Mr Parminter (Barry Morse) and a Police Superintendent (Paul Williamson) stop and arrest Brian Hamilton (Stuart Wilson) on the corner of Leake Street and York Road. Bert makes a telephone call instructing all his agents on ships to Lisbon to kill McGill. Under south bank of Hungerford Bridge Harry Rule (Robert Vaughan) and the Contessa (Nyree Dawn Porter) meet with Sneider (George Pravda) and he explains why the documents must be photographed rather than stolen. Establishing shot of the hall at night. Gene Bradley (Gene Barry) and Krista Magnus (Penelope Horner) go to Johnny Morgan's (Jim Norton) flat (Canterbury House) for more information about the contract on Bradley's life. 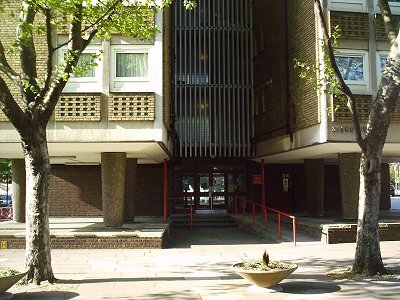 While Bradley discovers that Morgan has been murdered, Krista sees the murderers, Roberts (Peter Vaughn) and Buckley (Robin Hawdon), escape via the front entrance of the apartment block. Tim Gotha (Edward Judd) joins his foreman Blackie (Harold Goldblatt) on the construction site to discuss work practices. Blackie voices an opinion that the union will object to a larger crew because of safety factors of high-rise working. Having implemented the new work practices, Gotha pays Blackie another visit on the partially built building the next day, where the foreman voices his concerns. Seeing the shop steward Red (Jack Smethurst), Gotha walks over to him, but the union representative appears to have no problem with the larger crew causing working conditions to become more dangerous. The following day an Ambulance arrives at the site, where one of the workers has been struck by a rivet that has fallen from the construction above. A crowd of workmen, Gotha, Blackie and Red, all watch as the two Ambulance men put the injured man into their vehicle and then drive away. Having been informed that the workman died of his injuries, Gotha later goes back to the top of the construction intending to call the crew down, but Blackie arrives to reveal that the death was an accident not connected to the increased manning levels. Even so, Gotha quits his job as site manager and heads down to ground level. Gordon Lamble, head of the Chemical Warfare Establishment, climbs out of the hospital window, stands on the ledge and looks at the view (East Wing, St. Thomas’ Hospital under construction). Carlos Varell (Carlos Thompson) drives his Aston Martin over the bridge crossing (southbound) on his way to The office of Mercury International (by Butler’s Wharf). 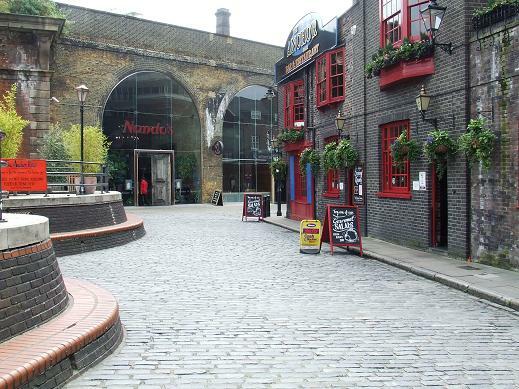 A delivery boy (Wilfred Downing) rides his bike along Shad Thames before turning into the wharf that is home to the Mercury International offices (by Butler’s Wharf). After visiting an exhibition on space travel, Boy (Anthony Corlan) accidentally bumps into Paula Wilde (Janice Rule) who is being photographed by her agent Sonny (Maurice Kaufmann). Charles Wilson is engrossed until he notices he is being followed by one of Dr Evans’ men, Hall. Charles tries to escape Hall, but ands up confronting him on the stairs to Waterloo Bridge (Royal Festival Hall, Hayward Gallery and Queen Elizabeth Hall). McGill follows the man who is following Rachel (Angela Browne) as she crosses a bridge. 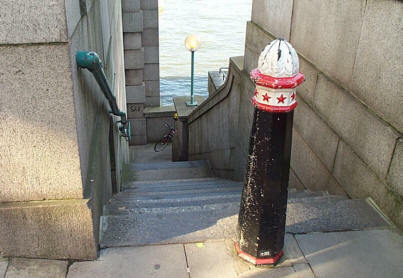 She descends to the embankment below (Bankside SE1) being followed all the while. Sara Knight (Jan Holden) walks calmly onto the bridge. She jumps from bridge which is witnessed by passers by and a policeman. Johnny Haswell (Donald Webster) and Rhys Brown (Dell Baker) are waiting down below in a boat with the body of Carolyn Spencer who they pretend to rescue from the Thames whilst Sara swims to shore. London, late at night, and two lovers find a quiet corner to park their Mini for a kiss. 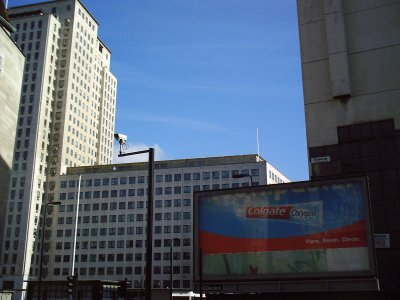 The headquarters of the Pure British League (Stangate House) where Adam Strange (Anthony Quayle) arrives to see Jill Crowley (Jane Merrow), Rick (Ram John Holder), Margaret (Cleo Sylvester) and others protesting against the League. Later Strange breaks into the building as Hamlyn Gynt (Kaz Garas) distracts the guard (Michael Goldie). Later still Glynn Crowley (Guy Doleman) and Drake (Karl Held). are arrested and takes away by the police. Simon Templar (Roger Moore) walks up and down the main entrance steps. An aerial shot of the station precedes the arrival of Geraldine McLeod (Nanette Newman) by train She is followed from the train by Franklin (Edward Jewesbury) who is stopped by Barlow (Michael Standing) at the ticket gate. After talking to Geraidine, Franklin slips a packet of tea into her bag. Both cross to the phones where Barlow kills Franklin. He reports to Atkins (Robert Brown) and both tail Templar and Geraldine when they leave the stationmaster's office. Templar and Geraldine leave the station in The Saint's Volvo, followed by Atkins and Barlow in a Jaguar. A few days later The Saint, in his Volvo, arrives at the station to meet the train with Dr. Osbert (Patrick Westwood) aboard he follows Dr. Osbert as he leaves the station in a taxi. Cordelia is sent to Waterloo Station to wait for The Baron who is hoping to get the Petrograd Icons from a left luggage locker. She is followed to the station by Seftan Folkard who sends one of his thugs after her. He returns to Folkard, who sends his girlfriend to inject Cordelia with a sedative and steals her clothes. Disguised as Cordelia, she waits by the locker, for The Baron to arrive. Brian Hamilton (Stuart Wilson) arrives at the bank (Lloyds Bank) to collect the money he owes Gene Bradley (Gene Barry). McGill races in his Hillman towards the Albert Bridge. Jeff (Mike Pratt) drops of Jeannie (Annette André) at Arthur de Crecy's apartment. Whist he is waiting Jeff is kidnapped by Elliot (Norman Bird) and Rawlings (Raymond Young) who drive off with him in their van. After the discovery that the used bank notes had been switched a police car races out of Battersea Power Station and out into the night (along Lambeth Palace Road). Establishing shot of London warehouses where a robbery is just about to take place. Mickey Keston waits on a cargo ship at the docks for the boat to sail. Establishing shot of docks as Police car ZB4 arrives at the Stone Warehouse looking for “Happy”. The Greshams find their way to meet their contact in Docklands.